I recently read a mystery, “Deader Homes & Gardens” by Joan Hess. I knew when I got to the second sentence of the prologue and the first word was “daffodils” that I would like the book. ;-> Imagine my surprise when I got to page 269 and the story gets around to digging daffodil bulbs in the summer. 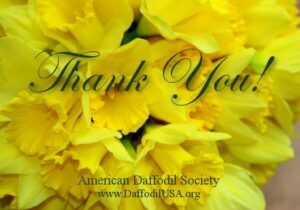 The character relates the origin of daffodils and the large number of registered cultivars, but a couple of paragraphs later she says, “I’m a card-carrying member of the American Daffodil Society.” Daffodils show up in the story again, but I won’t spoil it in case others like reading garden-themed mysteries, too.